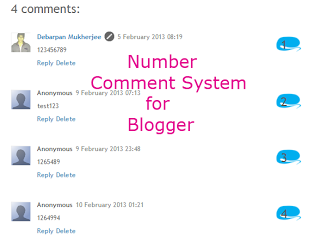 Here we strongly believe comment system is the most important part of any blog so we love to make tweak with this part of blogger.This is the most favourite part of us.We previouly already done several tweaks with blogger comment section..You can see this blog comment section,highly different from any other blogger blog.After doing any tweak we love to share that with our reader.So we love to produce tutorial on blogger comment system.So,Today we'll learn how we can add numbered comments along with comment bubbles on our blogger threaded comment system.You can see the screenshot as demo. Now search(ctrl+f) for ]]></b:skin> and above it paste the below code. to change the comment bubble, replace the code in purple with the URL address of your own icon. Hope this will surely improve your comment section looks.If you find this tutorial helpful then don't forget to subscribe our rss feed.Thanks for visiting.Stay with us for more such awesome upcoming tutorials.